Audre Lorde, African-american feminist activist and poet. 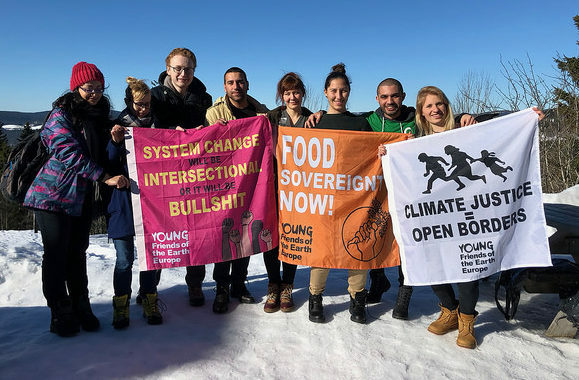 At the end of March, I attended a Young Friends of the Earth Europe training on intersectionality and how it is connected with the goal of achieving climate justice. Four facilitators from all over Europe, took me and thirty other participants on a journey of discovering, exploring and implementing intersectionality. This training has helped me to understand that we each carry different identities; each could be dominant, oppressed or a combination of both. Our identities intersect and overlap. When we don’t take into account this overlapping, people marginalised by the intersection of power structures are forgotten and not understood. As a result, it becomes impossible for them to ask for justice as our society cannot grasp their issue. To help explain, I will use the example given by Kimberlé Crenshaw, an African-American feminist scholar who coined the term ‘intersectionality’. She told the story of African-American women who weren’t hired at a company and filed a complaint for racism. They lost their case because the company hired African-Americans and women. However, the Department of Justice failed to recognise that it would only hire male African-Americans for technical jobs and only white women for administration jobs: African-American women didn’t fit into either category and so were discriminated against on the basis of their overlapping identity. In Norway, we spent four days understanding this concept and its connection with climate justice so that we could then lead training workshops in our national groups. The first step of the training was to dive into considering structural privilege and oppression in groups. How a dominant group is considered ‘the norm’ (the mainstream), and will knowingly or unknowingly silence other groups (the margins). Racism. Sexism. Homophobia. Classism. Ableism. Climate change. All of these power structures and so much more are addressed in our society as single-issue. One organisation for one ‘-ism’. For a long time I thought I had to choose between women’s rights, human rights or climate change actions. However, intersectionality is the understanding that the root of each power structure intersects and emerge from the same structural, dominative and violent roots. All of us have the potential to be oppressor and victim at the same time. In the training, we addressed first the fact that we needed to be aware of who we were as a group and as individuals and grasp our inner complexity. The conversation that happened was not about blaming and shaming individuals, but about understanding systemic patterns of oppressors-oppressed that we all grew up in, and are carefully taught to replicate over and over. I find intersectional thinking revolutionary, in the sense that it requires that civil society, NGOs and individuals join forces to tackle the root, instead of single-handedly addressing the consequences of oppression. If an organisation is asking for justice, justice should be then demanded for everyone, for communities on the margins and silenced voices. Because if we believe in justice, what is the point of achieving it for one group, while leaving others behind? This kind of work does not challenge dominant power structures and can lead to a previously marginalised group becoming an oppressor, such as white feminism silencing and ignoring women of colour. What does intersectionality have to do with climate change? In the training after exploring this concept, we then linked it with climate change and climate justice. As I understand it, the concept of climate justice takes into account the social injustices that a warming climate creates, and the historical and social responsibility of corporations and countries who benefited and still are from polluting and exploiting ecosystems. Environmental groups must then aim for their climate justice work to include solutions to the social impacts of climate change. I cannot talk and act as if climate change did not have any social and political repercussions and roots. Climate justice demands prioritising inclusive organising and integrating diverse groups and identities throughout our work. Solutions developed without including the voices of those most impacted are unlikely to be fair or sustainable solutions. Climate change impacts marginalised people and communities more significantly than others, on a international and local level. Globally, the countries least responsible for emissions and most impacted by systematic oppression, such as colonialism, are those now being hit the hardest by climate change. Locally, climatic changes and an extreme weather often impact people and communities who are marginalised in society more severely and for a longer period of time. This could be small scale farmers who are already being pushed out by industrial agriculture and are then hit by flooding or unpredictable weather. Or people and communities with less access to support and resources – such as communities of colour, working class and queer communities – who are most impacted by extreme weather events. Groups in the margins are prevented from finding resources to build resilience and efficient solutions. Beyond giving charity to affected communities we need to show solidarity, challenge the power relationship and work together without a group dominating another based on class, race, gender etc. In Scotland, when we talk about Just Transition, this may mean for example, that the process of planning the shift away from fossil fuels to sustainable jobs should include oil and gas workers. It should take into account that within this community, people will have other needs and wishes, beyond what another group in power assume this community needs, as if they are just one homogeneous group. One cannot simply demand the closing of oil rigs without providing a system that will help the communities who currently rely on the jobs of the oil rigs. I don’t want to see it being environmentalists versus workers, it should be communities working together to find long term solutions. Just transition within an intersectional perspective is an opportunity for Scotland to create jobs and opportunities that will fit the needs and address wider societal issues. The conversation and its implementation should happen with every level of civil society. It should be a just transition, for rural areas, for people marginalised by society and that struggle to find work and integration due to numerous reasons. An intersectional approach says that if the just transition only applies to white men in a specific area of Scotland, then we cannot honestly call it just, nor sustainable. Intersectionality requires us to address issues with a different perspective that calls for beautiful qualities such as solidarity, sharing and courage. Courage to challenge our way of behaving and delve deep into a common conversation, to overcome the barriers created by climate change impacts but to also address the roots of all injustices. Then we can work to find solutions that truly aim for justice and resilience for all. This was an amazing article. Thank you so much for briefly describing one of the most important needs of our future.